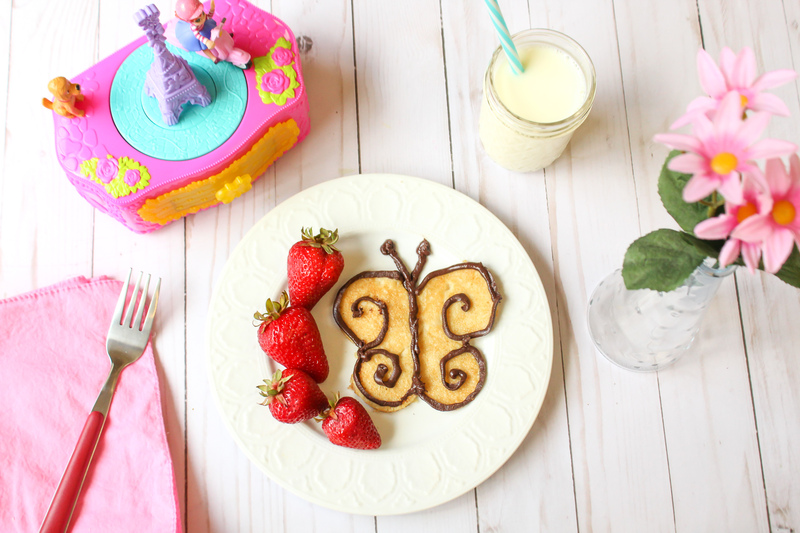 To celebrate the premiere of Disney Junior Fancy Nancy, a show my daughter already LOVES (the first episode was available for early download on Amazon), we had a fancy breakfast to celebrate – inspired by papillon (that’s French for butterfly, and Nancy just LOVES butterflies! Mix together dry crepe ingredients. Add in wet ingredients, and combine thoroughly. Using a medium pan, coat with coconut oil till melted and hot. On medium heat, pour in your better (making 1 crepe at a time). Cook until very lightly brown on each side. Use a Ziploc bag with a small whole cut in or a piping bag to pipe dark cocoa almond butter for the finishing touches of your butterfly.